Use of statin therapy in patients with type 2 diabetes mellitus (T2DM) has been recommended by most clinical guidelines. Cardiovascular disease (CVD) is a leading cause of morbidity and mortality among T2DM patients. It has been proved that statins are effective for primary or secondary CVD prophylaxis. Reports have highlighted the underutilization of statins in clinical practice and the suboptimal adherence to guideline recommendations. This review article points to summarize the current evidence confirming the role of statins in T2DM patients and to provide an overview of factors that may affect statins' prescribing patterns and compliance in clinical practice. 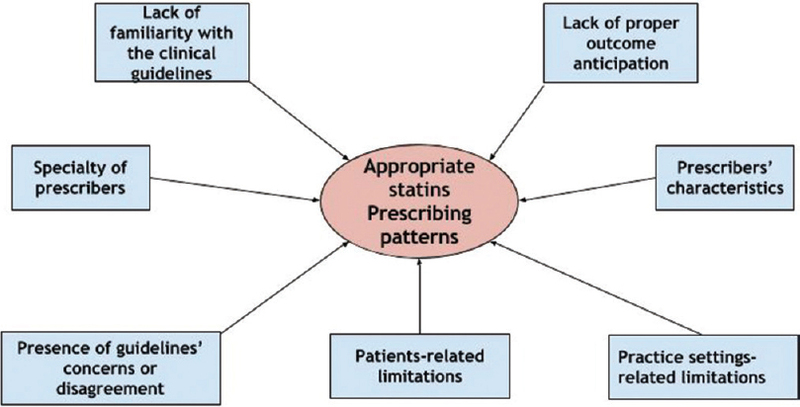 Initiatives to enhance statin therapy prescribing should recognize the comprehensive nature of the prescribing process. Attempts to assure proper statin prescribing and utilization can help in achieving better clinical outcomes of statin therapy. Background: Stress is a normal part of everyday life but chronic stress can lead to a variety of stress-related illnesses including hypertension, anxiety, and depression. In the present investigation, standardized leaf extract of Epipremnumaureum was evaluated for its anti-stress potential. Materials and Methods: For the evaluation of anti-stress activity, groups of mice (n = 6) were subjected to forced swim stress and anoxic stress tolerance test in mice 1h after daily treatment of E.aureumextract. Diazepam (5 mg/kg) was taken as a reference standard. Urinary vanillylmandelic acid (VMA) and ascorbic acid were selected as noninvasive biomarkers to assess the anti-stress activity and plasma cortisol, blood ascorbic acid, and weight of adrenal were measured. The 24 h urinary excretion of VMA and ascorbic acid were determined by spectrophotometric methods in all groups under normal and stressed conditions. The hematological parameters (neutrophils, lymphocytes, and eosinophils) were also determined. Results: Administration of E.aureumat doses of 400 and 600 mg/kg wasfound to be effective in inhibiting the stress induced urinary biochemical changes in a dose-dependent manner. Treatment with E. aureum extract prevents the rise in blood ascorbic acid and plasma cortisol. Moreover, the extract prevented the increase in weight of adrenal gland also significantly increased the anoxia stress tolerance time. Dose-dependent significant reduction in white blood cell count was observed in anoxic stress tolerance test as compared to stressed group. Conclusion: Hence, the present study provides scientific support for the positiveadaptogenic effect of E. aureum extract. Introduction: Physicians and nurses of emergency department are often the first line of qualified health-care providers attending the patient in person or parent's query over phone reporting immediately following the dental avulsion. Prompt action by them becomes the decisive factor in survival and prognosis of the tooth. Although a few researchers have evaluated knowledge of emergency room physicians, there is scanty of reports concerning nurses who play a climacteric role. Materials and Methods: A 10-item questionnaire regarding clinical situation apropos dental injury and tooth avulsion, inquiring knowledge of physicians and nurses was administered to 150 each of nursing professionals and physicians of the emergency department. Results: With 100% response rate, the data obtained was subjected to statistical analysis. Results showed lack of knowledge and confidence in both groups. About 66.7% (n = 100) nurses and 74.7% (n = 112) considered reimplantation of avulsed tooth. There was overbalanced confusion regarding storage/transport media and handling of avulsed tooth. Conclusion: The findings from the results suggested a definite inadequacy in knowledge, demanding need for appropriate training for delivering treatment with more predictability and better prognosis. Introduction: The treatment of Indian tropical disease such as kala-azar is likely to be troublesome to the clinicians as AmpB- and miltefosine-resistant Leishmania donovani has been reported. The rationale behind designed a novel inhibitors of model of L. donovani enolase and performing a binding study with its inhibitors to gain details of the interaction between protein residues and ligand molecules. Methods and Materials: The L. donovani enolase model consists of two typical domains. The N-terminal one contains three-stranded antiparallel β-sheets, followed by six α-helices. The C-terminal domain composes of eleven-stranded mixed α/β-barrel with connectivity. The first α-helix within the C-terminal domain, H7, and the second β-strand, S7, of the barrel domain was arranged in an antiparallel fashion compared to all other α-helices and β-strands. The root-mean-square deviation between predicted model and template is 0.4 Å. The overall conformation of L. donovani enolase model is similar to those of Trypanosoma cruzi enolase and Streptococcus pneumoniae enolase crystal structures. Result: The key amino acid residues within the docking complex model involved in the interaction between model enolase structure and ligand molecule are Lys70, Asn165, Ala168, Asp17, and Asn213. Conclusion: Our theoretical prediction may lead to the establishment of prophylactic and therapeutic approaches for the treatment of kala-azar. This biomedical informatics analysis will help us to combat future kala-azar. Background: Fatty acids occur in nearly all living organisms as the important predominant constituents of lipids. While all fatty acids have essentially the same chemical nature, they are an extremely diverse group of compounds. Materials and Methods: To test the hypothesis, fatty acids of alkaliphiles isolates, Bacillus subtilis SVUNM4, Bacillus licheniformis SVUNM8, Bacillus methylotrohicus SVUNM9, and Paenibacillus dendritiformis SVUNM11, were characterized compared using gas chromatography-mass spectrometry (GC-MS) analysis. Results: The content of investigated ten fatty acids, 1, 2-benzenedicarboxylic acid butyl 2-methylpropyl ester, phthalic acid, isobutyl 2-pentyl ester, dibutyl phthalate, cyclotrisiloxane, hexamethyl, cyclotetrasiloxane, octamethyl, dodecamethyl, heptasiloxane 1,1,3,3,5,5,7,7,9,9,11,11,13,13-etradecamethyl, 7,15-dihydroxydehydroabietic acid, methyl ester, di (trimethylsilyl) ether, hentriacontane, 2-thiopheneacetic acid, undec-2-enyl ester, obviously varied among four species, suggesting each species has its own fatty acid pattern. 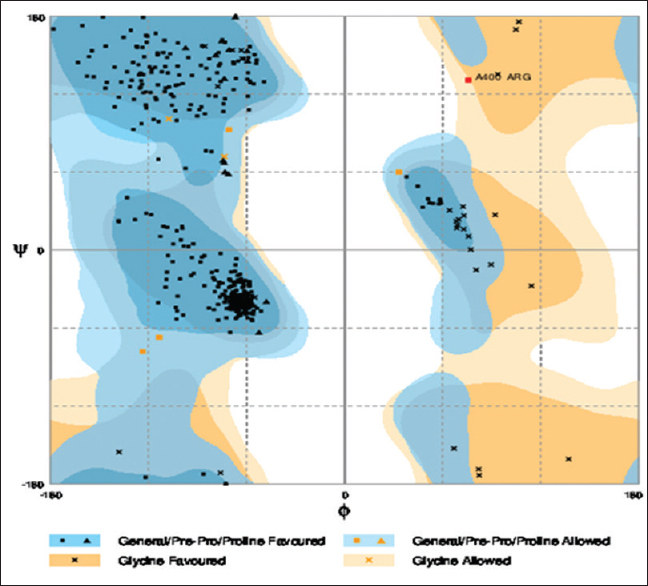 Conclusions: These findings demonstrated that GC-MS-based fatty acid profiling analysis provides the reliable platform to classify these four species, which is helpful for ensuring their biotechnological interest and novel chemotaxonomic. Background and Objectives: Students in relevant health-care academic programs are the future professionals who should play an active role in increasing community awareness regarding chronic diseases such as osteoporosis. This research aimed to evaluate the knowledge of osteoporosis, one of the growing health-care burdens in Malaysia, among students belong to three different health occupations programs in a Malaysian University. Methods: A cross-sectional study design was conducted to assess the level of knowledge on osteoporosis and to explore the potential association between the study program and osteoporosis-related knowledge among medicine, pharmacy, and allied health sciences students in a Malaysian University. A total of 348 students were approached. The data were collected using validated revised Osteoporosis Knowledge Test questionnaire. Results: The results showed variability in knowledge score between students belonging to different study programs. 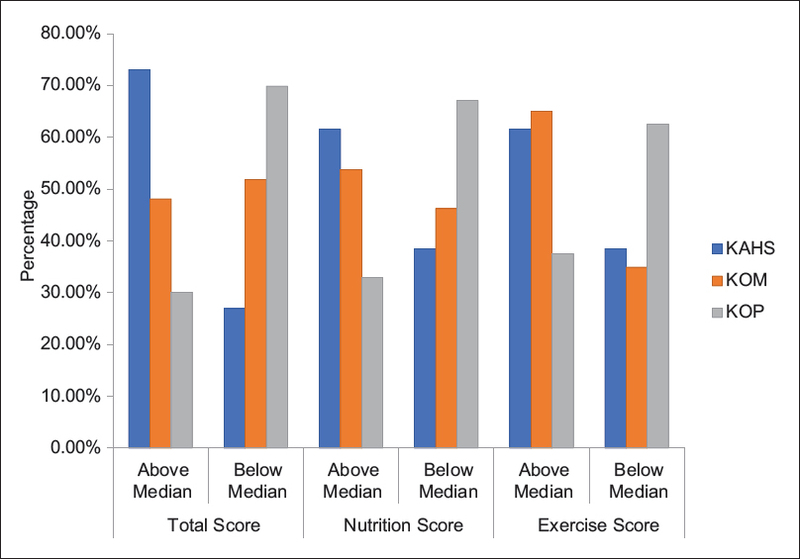 allied health sciences students have the highest overall total score (median = 20) and nutrition score (median = 16), but for exercise score, both students in allied health sciences and medicine programs shared a similar median score (median = 11.5). More than half of the respondents showed adequate knowledge on osteoporosis. The students from allied health sciences exhibited more knowledge on osteoporosis compared to students in other study programs. Among the Kulliyyah of Pharmacy respondents, the majority did not manage to answer correctly on the whole scale. This was evident by total percentage of 69.91% of the respondents scored below than median score. Conclusion: There is a considerable gap of knowledge regarding osteoporosis among students in various health occupations academic programs. Pharmacy students particularly need focused learning related to exercise and nutrition in preventing osteoporosis during their academic program. Aim: The present study was aimed to highlight the current prescribing pattern of oral hypoglycemia in type 2 diabetes mellitus and to evaluate the therapeutic effectiveness of these therapeutic categories in achieving target glycemic control. Methods: This is a prospective, cross-sectional, observational study of 6 months' duration conducted in a tertiary care hospital of Lahore, Pakistan. Results: The current research recruited 145 patients presented in diabetes management center of a tertiary care hospital in Lahore, Pakistan. Mean age of the participants was 50.2 (± 8.5) years. Out of the 145 patients, 63% were females and 37% were males. Most patients were diagnosed to have diabetes within the past 5 years. Diabetes-induced neuropathy was the most common complication (71.7%) among the patients. A large proportion of these patients (70.3%) were also suffering from other comorbidities among which the most common one is hypertension. The average number of prescribed medications was 1.31. Metformin was prescribed to a majority of patients (64%) as monotherapy while 28.96% received combination therapy. Mean glycated hemoglobin (HBA1c) before and after 3 months of treatment was 8.5 (± 2.3) and 8.04 (± 2.1), respectively. Inferential statistics show a strong association between HBA1c and life style modifications and adherence to medication therapy (P = 0.05). However, the correlation between HBA1c and Morisky score and duration of disease was inverse and weak (P = 0.6, 0.4). The t-test values show a small difference between HBA1c values before and after 3 months (t = 0.440 and 0.466, respectively). Conclusion: Optimization of medication regimen and continuous patient education regarding life style modification and adherence to medication therapy are necessitated to bring HBA1c values near to target. Introduction: Sulfacetamide sodium is a widely used sulfonamide for ophthalmic infections. 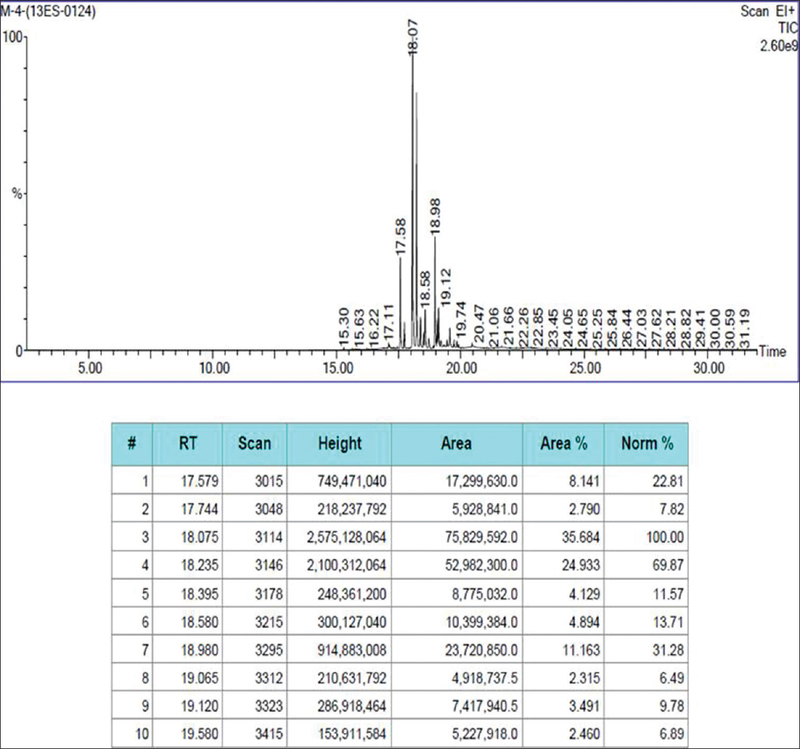 Objective: A number of analytical methods have been reported for the analysis of sulfacetamide but they lack the ability to determine both the active drug and its major degradation product, sulfanilamide, simultaneously in a sample. 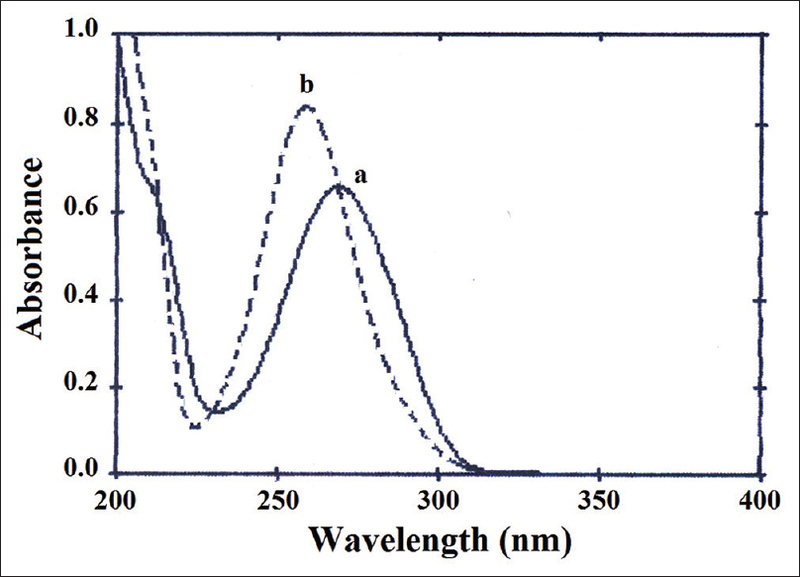 Materials and Methods: In the present study a simple, rapid and economical stability-indicating UV spectrometric method has been validated for the simultaneous assay of sulfacetamide sodium and sulfanilamide in pure form and in ophthalmic preparations. Results: The method has been found to be accurate (recovery 100.03 ±0.589%) and precise (RSD 0.587%) with detectable and quantifiable limits of 1.67×10–6 M (0.04 mg%) and 5.07×10–6 M (0.13 mg%), respectively for the assay of pure sulfacetamide sodium. The method is also found to be accurate and precise to small changes in wavelength, pH and buffer concentration as well as to forced degradation. The study further includes the validation of the method for the assay of pure sulfanilamide in solution, which has been found to be accurate, precise and robust. Conclusion: The results indicate that the proposed two-component spectrometric method is stability-indicating and can be used for the simultaneous assay of both sulfacetamide sodium and sulfanilamide in synthetic mixtures and degraded solutions. Context: Nanocarriers possessing long-circulating abilities could take advantage of the pathophysiology of tumor vasculature to achieve spatial placement. To attain such qualities, the drug carriers should possess suitable physicochemical properties such as size and surface hydrophilicity. Aim: The aim of this study was to prepare poly(ε-caprolactone) nanoparticles (NPs) loaded with vinorelbine bitartrate (VB) and to modify its steric properties using polyethylene glycol and poloxamer. Furthermore, the influence of surface modification of NPs on their physicochemical and cell interactive properties was evaluated. Materials and Methods: NPs were prepared by double emulsion solvent extraction–evaporation technique. The prepared NPs were evaluated for their physicochemical properties, in vitro protein adsorption and cell cytotoxicity. Results and Discussion: The NPs were <250 nm with an entrapment efficiency ranging between 40% and 52%. The zeta potential of the NPs varied from −7.52 mV to −1.27 mV depending on the surface modification. 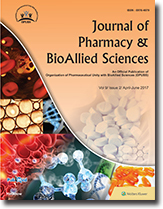 The in vitro release studies exhibited a biphasic pattern with an initial burst release followed by controlled release of the drug over 72 h. The protein adsorption studies revealed that the ability to resist protein adsorption was influenced by the concentration of surface-modifying agents and the amount of proteins available for interaction. 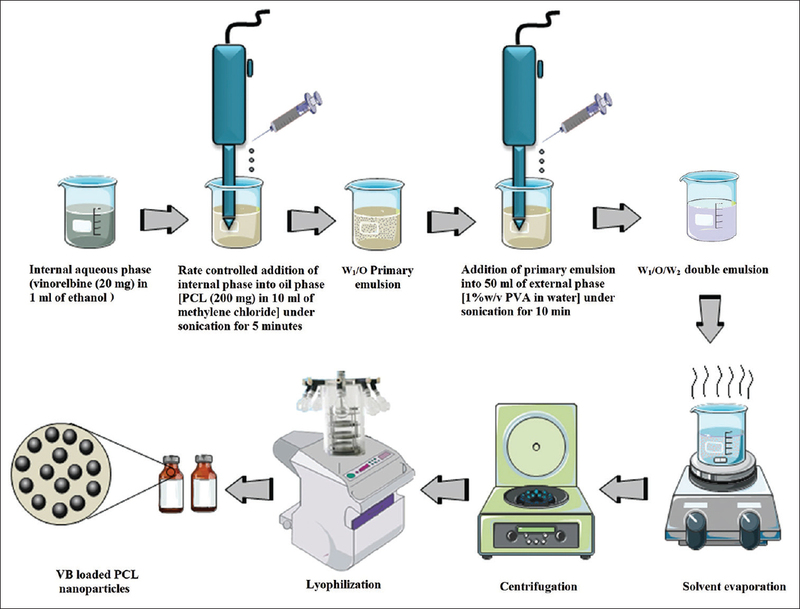 The surface-modified NPs produced cell cytotoxicity comparable to free VB at higher concentrations owing to sustained release of the drug into the cellular environment. Conclusion: The results emphasize that surface modification of nanocarriers is an essential and effective tool to dodge opsonization and phagocytosis in the physiological milieu. Aims: In flu pandemics, pharmacy students' knowledge, attitudes, and practices are critical to save patients life. The objective of study was to determine the knowledge of and attitude toward the pandemic influenza among the pharmacy students of Karachi, Pakistan. Settings and Designs: The cross-sectional study was conducted from September to December 2014 by adopting a prevalidated questionnaire distributed to senior pharmacy students (final year) in seven private and public sector universities of Karachi. Materials and Methods: A total of 443 pharmacy students responded the survey. Data regarding sociodemographic characteristics of the students, perceptions, level of knowledge and attitudes toward influenza, and prophylactic measures were collected. Statistical Analysis: To compute the correlation between different variables, data were analyzed using Pearson's Chi-square statistic method. P< 0.05 was considered statistical significance for all analysis. Results: Influenza was identified as a viral disease (n = 423; 95.48%) and 282 (71.2%) students correctly identified it as disease affecting humans and pigs. Textbooks reported as most common source of knowledge (n = 282; 64%). Most common symptoms identified were fever (81.94%), sore throat (64.1%), and nonproductive cough (43.34%). The most common preventive measures were covering nose and mouth (268; 60.5%) and wearing protective coverings (254; 57.3%). Only half of the students correctly reported about the route of administration (180; 40.6%) and strains in vaccine (186; 41.98%). The best time for administration of such vaccine was known by only 156 pharmacy students (35.34%). The majority of the students (82.6%) had no idea about the manifestation of influenza pandemic. 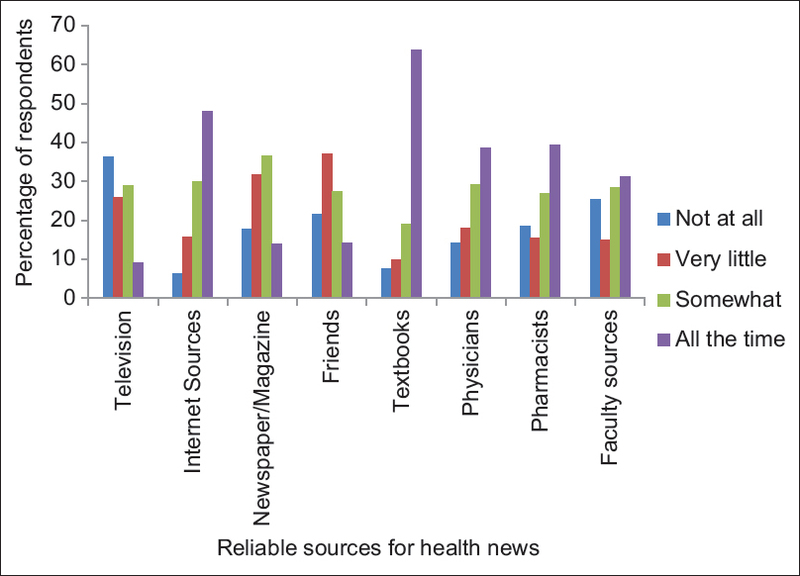 Knowledge regarding influenza differed according to gender and institutions differing in their affiliation with tertiary care hospitals. Conclusion: It was observed that knowledge about disease progression, transmission, vaccination, and treatment in pharmacy students, especially those who are not getting clinical training in tertiary care hospitals was limited. There is an urgent need to develop awareness programs to increase knowledge of influenza among clinical pharmacists as they are more susceptible to infections and community as a whole.